Desc: Sterling Silver whimsical Sea Horse pin/pendant. The Sterling Silver box chain is 18 inches long and has a spring ring clasp. 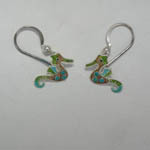 The Sea Horse has vibrant blue, green, and brown enamel. Eight green Swarovski crystals are bezel set in the chest of the Sea Horse. One black crystal is bezel set as the eye. 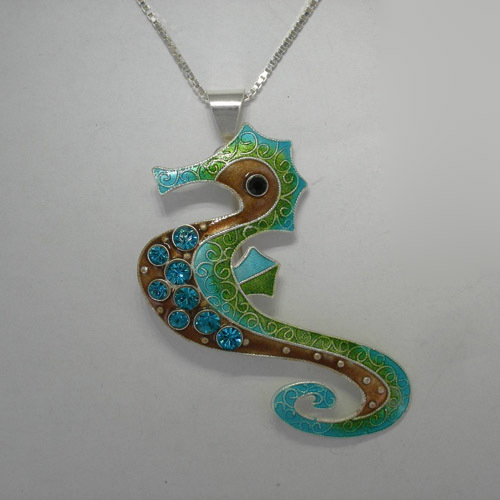 The Sea Horse can be worn as a brooch or as a necklace and has a bright polish finish. We have matching earrings, see SK923.